Phase 2. Design work and specifying done in this phase are referred to as the preparation of the Bridging Contract Documents (BCDs) and involve the ODC developing all important and critical aspects of the architectural design including at least the controlling details of the design. This design work and document preparation for a Bridging project is carried out at the same point in the sequence of design as the Design Development phase of services in the traditional Design-Bid-Build with about the same or somewhat greater overall level effort as in the production of typical Design Development (“DD”) documents. However, the Bridging Contract Documents (BCDs) are substantially different from DD documents. Use of typical DD documents at this point will probably cause a failure in the project in terms of both cost control for the Owner and in the Owner not receiving the expected end product and design quality. During the production of the BCDs the architectural design and controlling architectural details are quite advanced. However, very little is completed in the way of engineering drawings with the exception of a few details that define issues that cannot be protected otherwise. As the below chart indicates, there will have been a good bit of consultation with the architectural designers by the ODC’s consulting engineers. The objective is to design, select, specify and otherwise tie down everything that determines the end product while leaving the proposing contractors and their architects and engineers as much opportunity and latitude as is prudent for them to design, engineer, and specify all other parts of the project so that the Contractor, in turn, is able to give the Owner the best construction price and time of completion commitment. This diagrams shows the typical level of effort by the ODC and its consulting engineers in preparing the BCDs. The vertical marker near the horizontal center of the illustration above is the level to which drawings and preliminary specifications would be prepared for all components of the construction by the time traditional Design Development (“DD”) documents are complete. 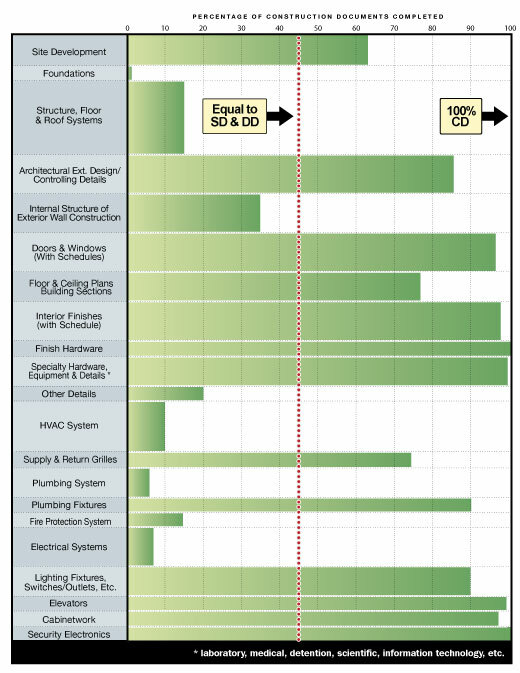 The green bars indicate a typical level of completion or lack thereof in a properly prepared set of Bridging Contract Documents (“BCDs”). The BCDs must fully protect all aspects of the Owner’s needs and requirements for the architectural and engineering components of the project while allowing a proposing contractor as much latitude as is prudent to employ means and methods that will allow the contractor to give the Owner the best fixed price and time of completion commitment. Failure to follow this process probably will lead to problems and unexpected additional costs to the Owner. The process may not be properly referred to as “Bridging” if this guide is not followed. The concept of preparing the Bridging Contract Documents is best described in several examples: In the preparation of Bridging Contract Documents (“bid documents”), foundations are rarely if ever designed in the BCDs are covered completely by code and/or by “performance” or design criteria specifications. Whereas, the finish hardware schedule, usually prepared by an architect late in the final Contract Document phase in the traditional process, must be fully developed and included in the BCDs. Another example is related to the plumbing section. For much of the plumbing system there would be reliance on the applicable building code and performance specifications possibly stipulating special conditions such as the elimination of certain piping materials allowed by some codes. Yet all plumbing fixtures, fittings and user devises would be selected and fully specified by model numbers, usually for multiple manufacturers. If in doubt, the ODC should err on the side of specificity, while keeping in mind that it is in the best interests of the Owner to leave as much latitude as is prudent for the Contractor and the Contractor’s “production” architect and engineers to be able to quote the best price and time of completion commitment. The degree of detail in the BCDs should be based on sound judgment calls by the ODC. Such special situations as special security systems and medical details will often need to be quite advanced by the ODC. In the final analysis, the BCDs must protect the design, protect the visible and operative details of the design, and protect the Owner contractually.